Green is etymologically related to growth. What is green is growing and fertile. It will develop and develop. However, green also means naive and inexperienced. An inexperienced boy is a ‘greenhorn’; a rookie. He is compared here with the young green leaf. They say he is ‘not yet dry behind the ears’, or else: ‘he is still green behind his ears’. The Green man is young, full of vigor and potency and still has to ‘ outgrown’, so be initiated into the secrets of the adult world. 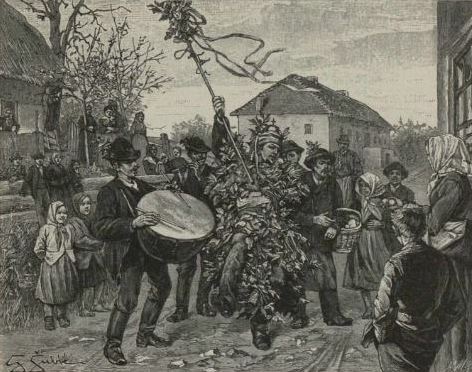 Hereby a number of folk rituals and parades in which a man covered in leaves was carried away. 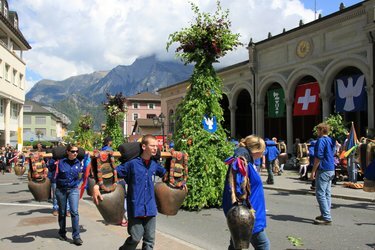 These rituals were held at different places in Europe during the mornings. 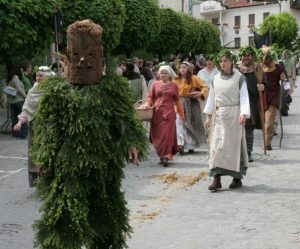 The best-known examples are the procession with the ‘Jack in the Green’ in England, with the Green Joris in Romania, the Austrian ‘Pfingstl’ and the Dutch Klissenboer. and the Zeleny Juray from Yugoslavia. What significance can you give to these rituals when you view them as initiation and fertility rituals? 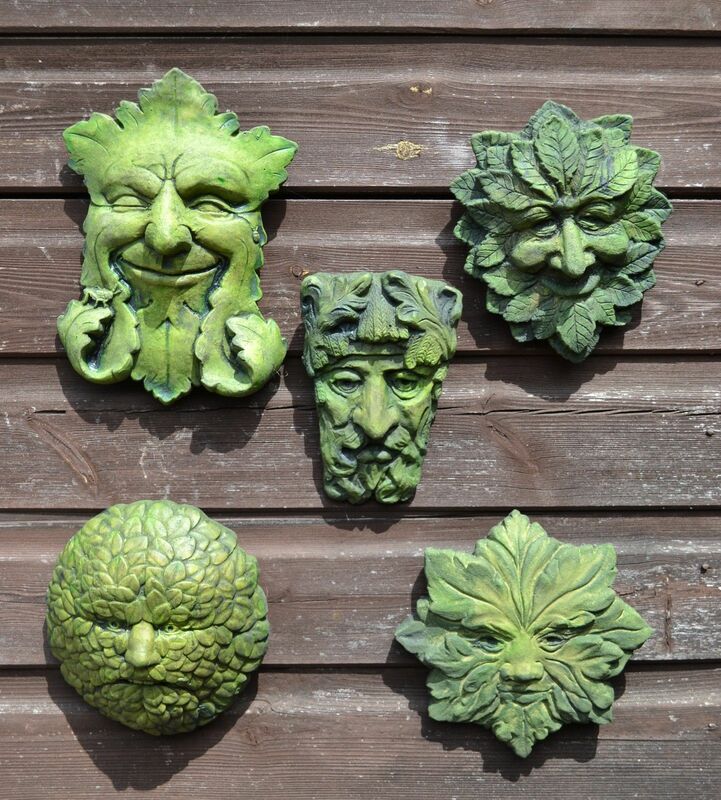 Especially the connection between the Green man and the Wildeman can give us new insights about the meaning of the Green man. What is the meaning of this if you view this as an initiation and fertility ritual? 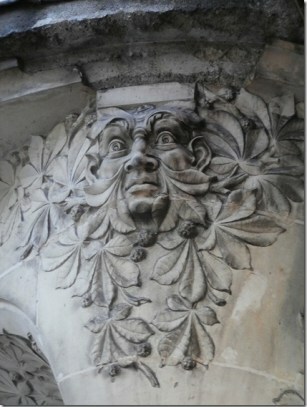 Especially the connection between the Green Man and the Wildeman gave new insights about the meaning of the Green Man. we start with the English Jack-in-the-Green. This is part of the May party. 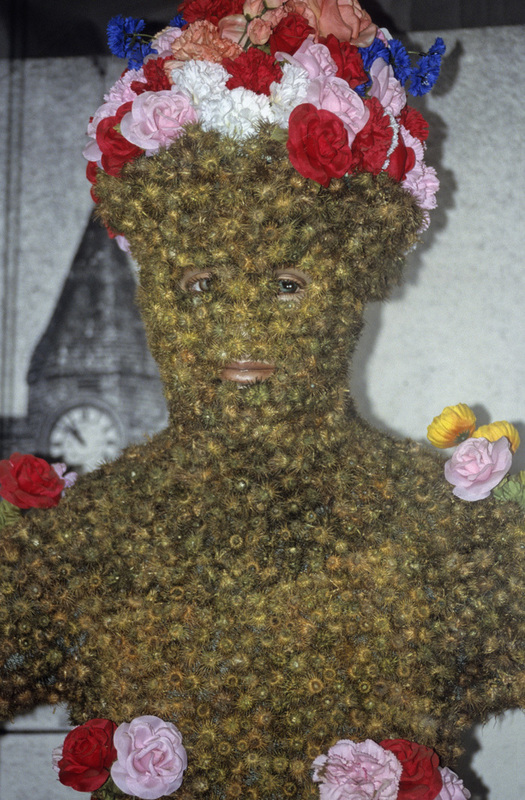 The Jack is a man hidden in a pyramid made of willow twigs and covered with holly and ivy leaves. He walks along in a procession together with the chimney sweepers and the May King and May Queen or else Robin Hood and Maid Marian. In England it remains with a procession and money collection without further ritual elements. 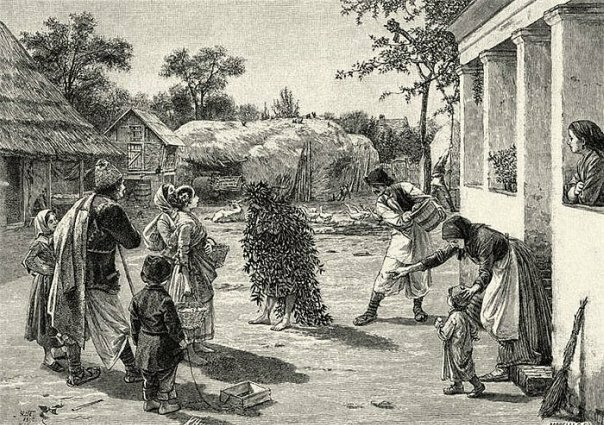 Among other things, with the gypsies of Romania Green Joris was celebrated on Easter Monday or with Saint George (April 23). 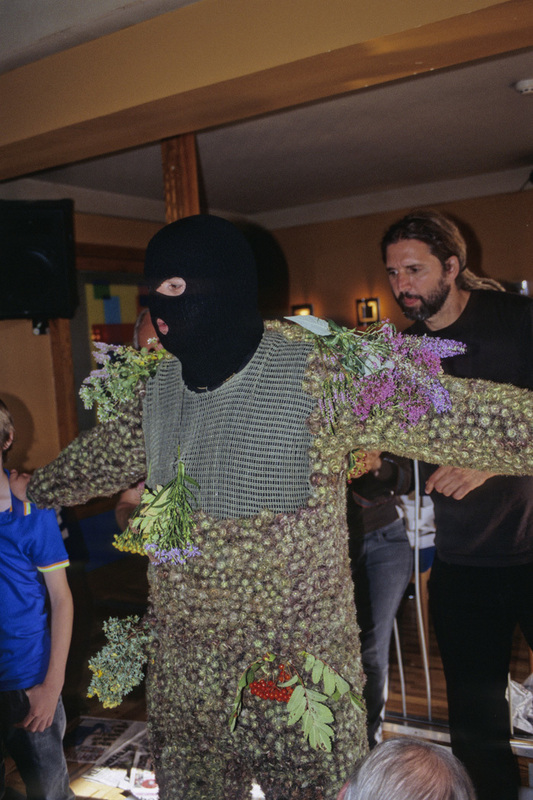 Green Joris is a boy who is covered with leaves of the birch. 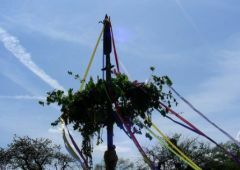 He is shown around with a decorated maypole. The tree is set up and Joris thrown into the water. Often the boy creeps out secretly and the casing is drowned. The Green Joris also gives grass to cattle so that they will have enough feed next year. He also stores three nails in the maypole and then throws them in running water. 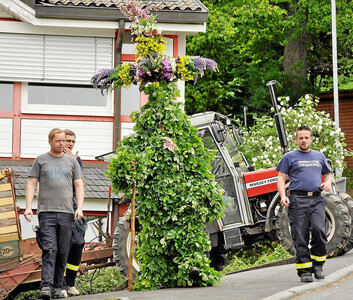 In Germany in Swabia and Bavaria there is the Pfingstl, also called the Pentecostal lump. At Pentecost he is dressed in flowers and leaves of alder and hazel. He gets a high point hat with only holes in front of his eyes or else an artificial head. In a procession this figure goes through the village accompanied by boys with drawn swords. 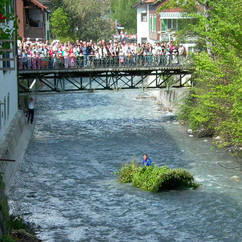 First the Pfingstl is splashed wet, then he is pushed into the river where the boys pretend to chop off his head and sacrifice him. Here he loses his artificial head or hat. 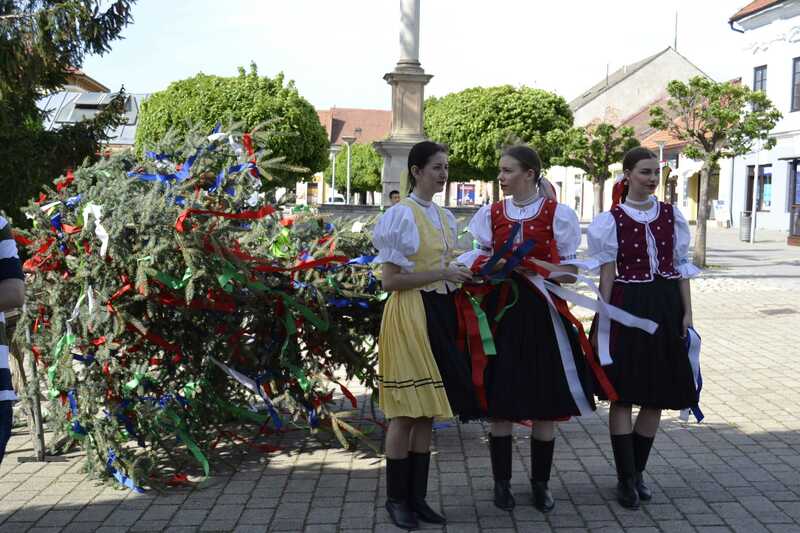 In Swaben a maypole is removed from the forest at the same time, the last person who comes to help is dressed as the Pfingstl. Then there is also a black man and a wild man. The latter is called doctor “iron beard”. In one version of the ritual, this ‘doctor’ revives the Pfingstl by leaving him vein. 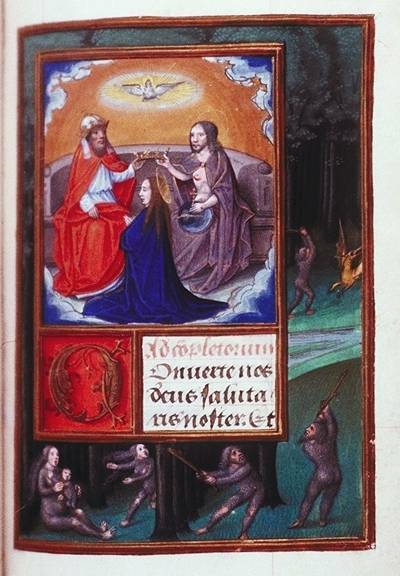 At last a ceremony is being held in Saxony at Pentecost called ‘de Wildeman hunting out the forest’. 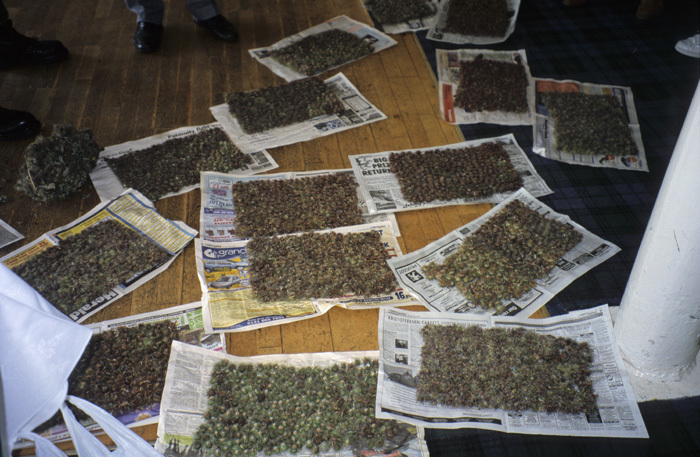 Here a young man is wrapped in leaf and moss. This is the so-called Wildeman who is hunted from the forest and then shot down. A ‘doctor’ makes a loss where fake blood flows on the floor and the boy revives. 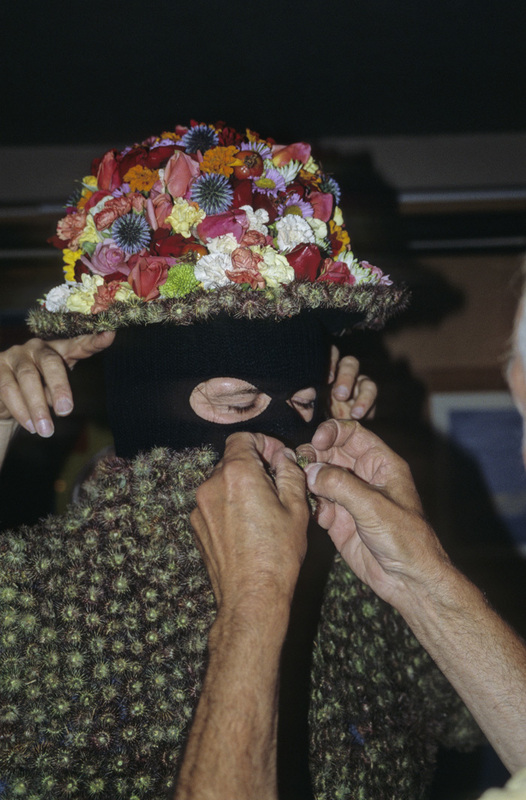 From the Jack-in-the-Green ritual there are already sources from the sixteenth century. The other rituals were not written until the nineteenth century. How long have they been performed before and in what way does nobody know. 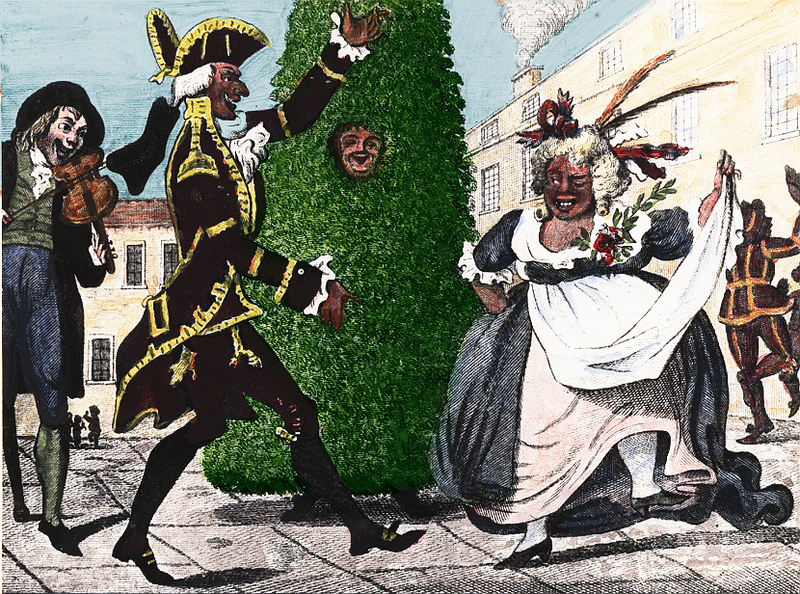 Apart from the Jack-in-the-Green, I also do not know whether the rituals are still being performed today. In any case, the Klissenboer will no longer pass through the Dutch streets. 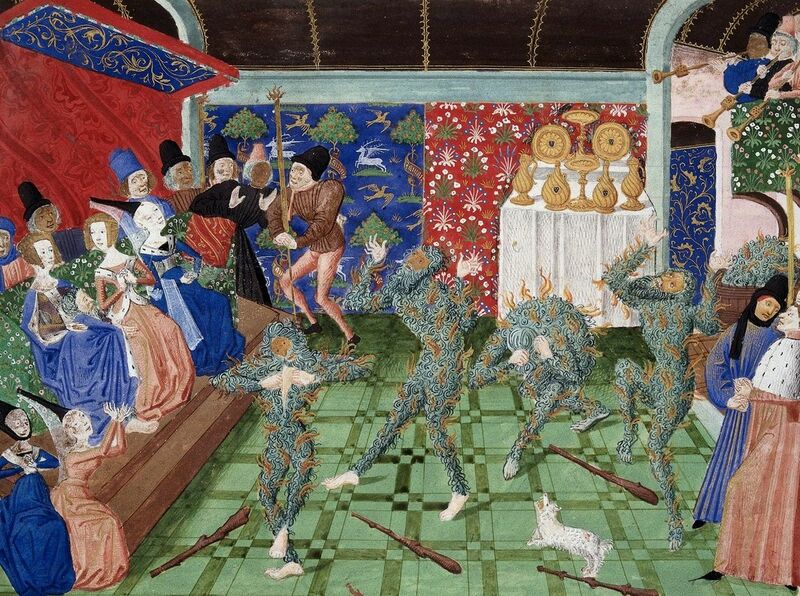 The Bal des Ardents (Ball of the Burning Men or Bal des Sauvages (Ball of the Wild Men) was a masquerade ball held on 28 January 1393 in Paris at which Charles VI of France performed in a dance with five members of the French nobility. Four of the dancers were killed in a fire caused by a torch brought in by a spectator, Charles’s brother Louis, Duke of Orléans. Charles and another of the dancers survived. The ball was one of a number of events intended to entertain the young king, who the previous summer had suffered an attack of insanity. The event undermined confidence in Charles’s capacity to rule; Parisians considered it proof of courtly decadence and threatened to rebel against the more powerful members of the nobility. The public’s outrage forced the King and his brother Orléans, whom a contemporary chronicler accused of attempted regicide and sorcery, to offer penance for the event. 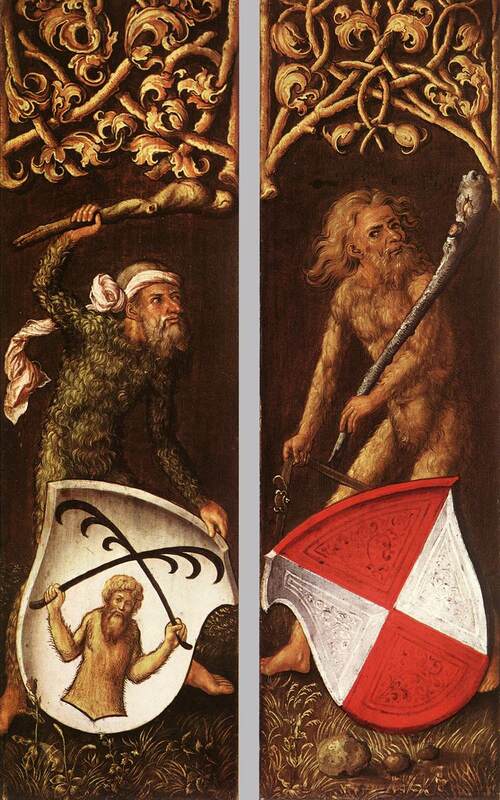 Folkloric and Christian representations of wild men. Veenstra writes in Magic and Divination at the Courts of Burgundy and France that the Bal des Ardents reveals the tension between Christian beliefs and the latent paganism that existed in 14th-century society. According to him, the event “laid bare a great cultural struggle with the past but also became an ominous foreshadowing of the future. Wild men or savages—usually depicted carrying staves or clubs, living beyond the bounds of civilization without shelter or fire, lacking feelings and souls—were then a metaphor for man without God. Common superstition held that long-haired wild men, known as lutins, who danced to firelight either to conjure demons or as part of fertility rituals, lived in mountainous areas such as the Pyrenees. In some village charivaris at harvest or planting time dancers dressed as wild men, to represent demons, were ceremonially captured and then an effigy of them was symbolically burnt to appease evil spirits. The church, however, considered these rituals pagan and demonic. Veenstra explains that it was believed that by dressing as wild men, villagers ritualistically “conjured demons by imitating them”—although at that period penitentials forbade a belief in wild men or an imitation of them, such as the costumed dance at Isabeau’s event. 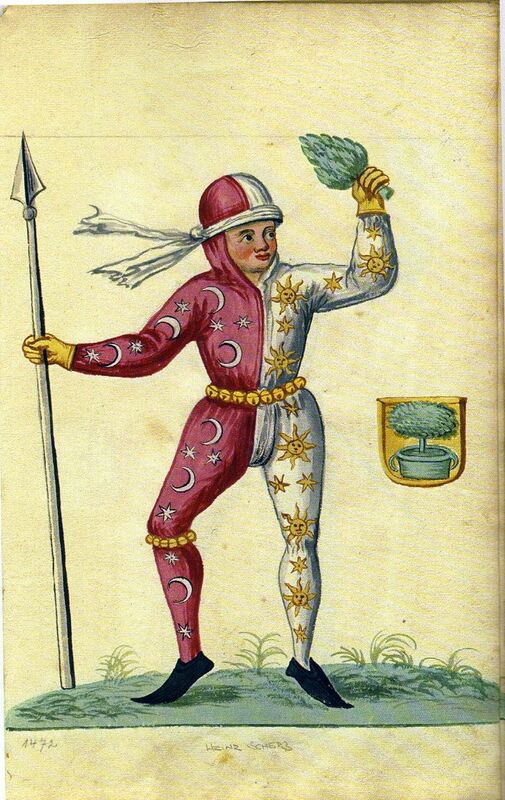 In folkloric rituals the “burning did not happen literally but in effigie”, he writes, “contrary to the Bal des Ardents where the seasonal fertility rite had watered down to courtly entertainment, but where burning had been promoted to a dreadful reality.” A 15th-century chronicle describes the Bal des Ardents as una corea procurance demone (“a dance to ward off the devil”). Because remarriage was often thought to be a sacrilege—common belief (contrary to the Gospel – Luke 20:27–40 and Matthew 22:29–30) was that the sacrament of marriage extended beyond death—it was censured by the community. Thus the purpose of the Bal des Ardents was twofold: to entertain the court and to humiliate and rebuke Isabeau’s lady-in-waiting—in an inherently pagan manner, which the Monk of St Denis seemed to dislike. A ritual burning on the wedding night of a woman who was remarrying had Christian origins as well, according to Veenstra. The Book of Tobit partly concerns a woman who had seven husbands murdered by the demon Asmodeus; she is eventually freed of the demon by the burning of the heart and liver of a fish. The event also may have served as a symbolic exorcism of Charles’s mental illness at a time when magicians and sorcerers were commonly consulted by members of the court. In the early 15th century, ritual burning of evil, demonic, or Satanic forces was not uncommon as shown by Orléans’s later persecution of the King’s physician Jehan de Bar, who was burned to death after confessing, under torture, to practicing sorcery. 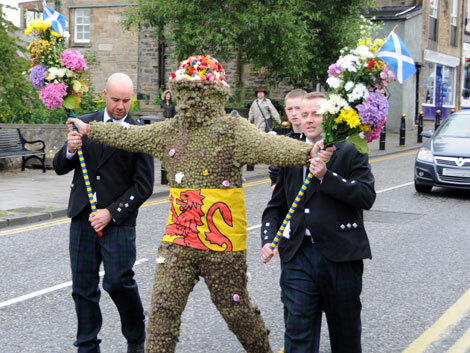 Especially in the more extensive rituals, the Green Man awaits a ritual death after which a rebirth takes place. The Wildeman Iron Beard, performed in Swabia, has a crucial role in finding a meaning in this ritual. Iron beard is very similar to Iron John / Iron hans (Ijzerhans), the Wildeman in the eponymous fairytale of the Brothers Grimm. Here a young inexperienced prince is taken into the forest by a Wild man to a holy place with a pure source. Here the boy is tried, he does not pass the test, but knows later after many adventures helped by Ijzerhans to reach his life goal. He becomes a hero and can marry the princess. This fairy tale can be seen as the story of an initiation of a boy to an adult man. 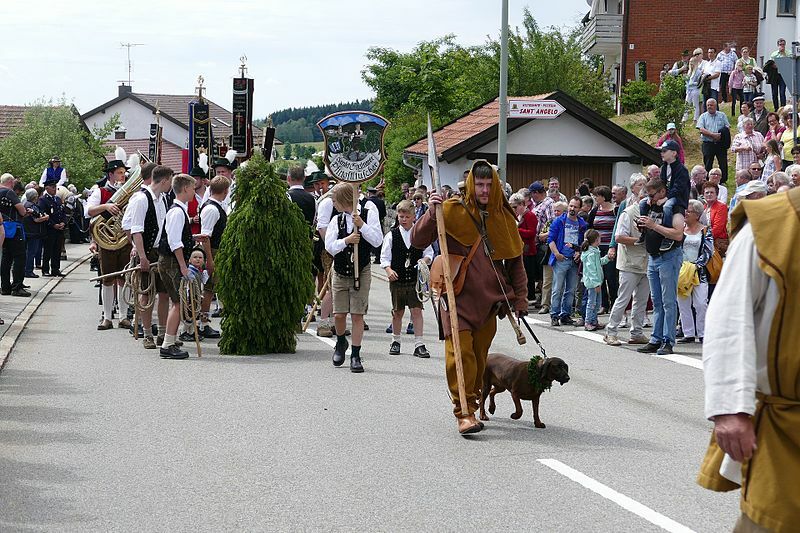 In pictures from the 16th century of Schembartlaufen (a procession with fasting lives) in Germany we see a Wild man with a green belt that hangs a – possibly masked – bound boy on his staff or tree. He is the ghost or spirit with the beard (Schembart). You could see this scene as a scene from an initiation of a boy by hanging on a tree. This strongly resembles the Germanic hangritus. 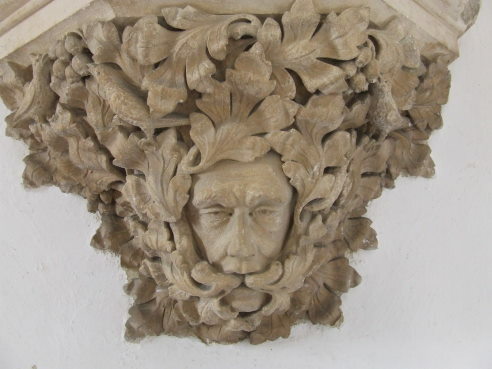 This image leads me to associate the Wilde man with Odin and thereby to compare the Green Man with a young man to be ordained by Odin (or his representative). The inexperienced lad gets the green mask set up or is surrounded by green leaves and is therefore made liminal; he becomes a being of the border. From that moment on he is a spirit, not a being of the forest, not of the village, but in between on the border. His situation is so painfully illustrated. His I is not yet able to control the energy, the green, his inner tree. He is only part of the energy flow. The boy must therefore die to be born again and make room for the grown man. He is as long as the rite lasts under the care of the lord of the forest. It is possible that this spirit is called Silvanus (when it comes to Southern Europe) or Odin (Northern Europe). But whatever name you give him; he is the initiating deity who rules the boundary between wild nature and the cultivated world. In the Middle Ages we know him as the Wildeman. He has a club in his hand as a symbol of decisiveness and fire or else a rooted tree with roots and all. He is fierce, frightening, horny and repulsively horrible. (As Odin was in the pagan times.) The green or brown hair and the garland around his waist and head give him strength. Yet he is not a victim of his urges, of his savage primal energy. He controls them by means of the tree or club he has in his hand. He can thus conduct his own energy. He can kill with it, but also bring it to life. As an initiator, he uses his tree to hang the boy on. (As Odin already did in the pagan hangritus after which his followers became part of the Berserkers.) You can see this in the pictures of Schembartlaufen. This hanging can be compared to the symbolic decapitation of the Pfingstl. 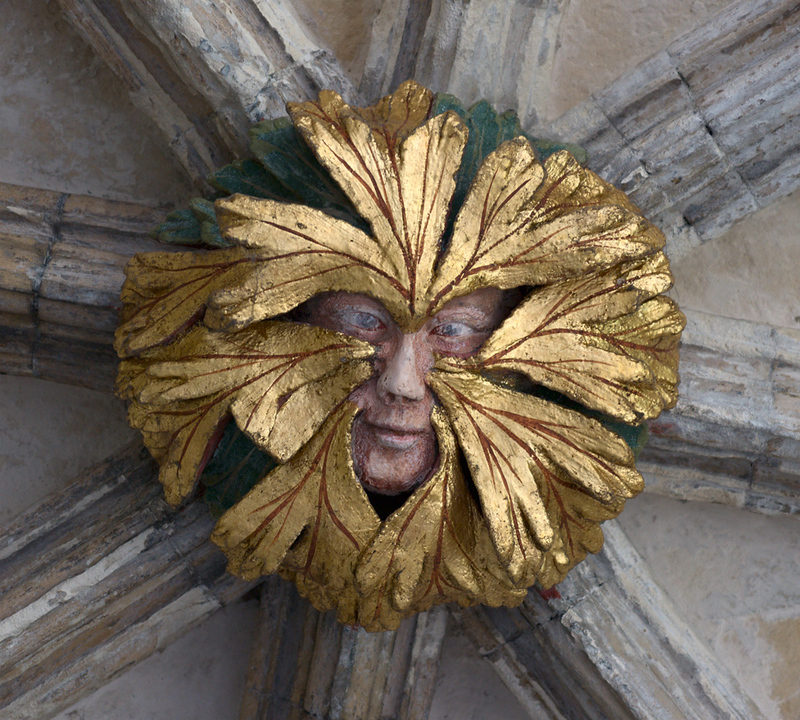 The Green Man stares us to his pillared tree, with his tormented or serene gaze. He is part of wild nature, he is our connection with that nature. This is nice when it comes to a tree spirit or vegetation demon. But when it comes to a human being, it is a caged soul behind its mask of leaves. He is an immature soul who is dominated by his urges and does not yet have the handle in his own hands. Only in his second stage when the green flows from his mouth (and possibly eyes and ears) is there a transformation. It is the moment of the (blood) sacrifice. 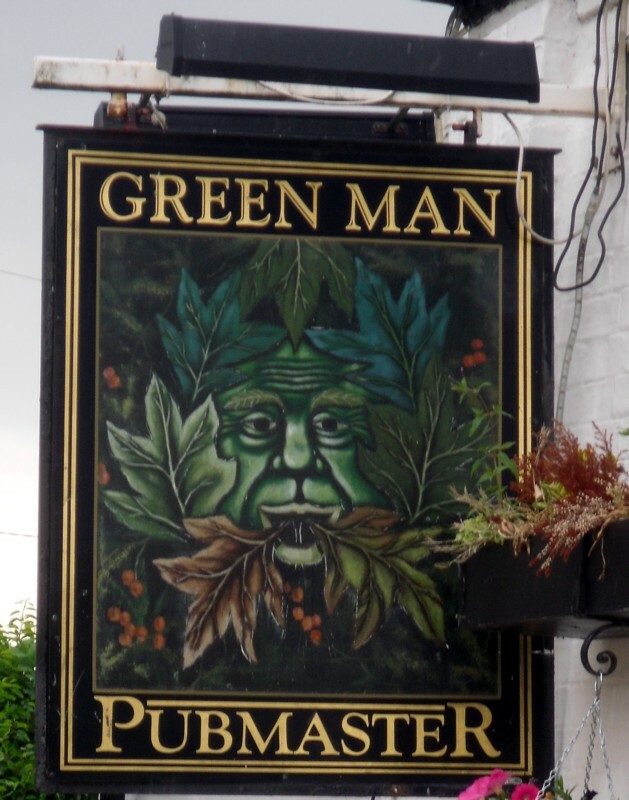 The Green Man is killed and can be born again. His sacrifice initiates a flow of energy. This abundance is made visible by the vegetation that flows from all its openings. In his next stage he got her on the chest and on the teeth. He has become a Wildeman! He has torn away from his tree. The pole brought along with the Green Man from the forest is a sign of victory over the (own) nature in the middle of the village and can be climbed if desired. You will never find the Wildeman on pillars. Yet he can also be found in some churches, but in the choir screen. On the border between profane and holy, as already protected the border between nature and culture. Only the initiates may go past the choir fence to the place of the ritual meal. Christians saw these images from a different perspective. 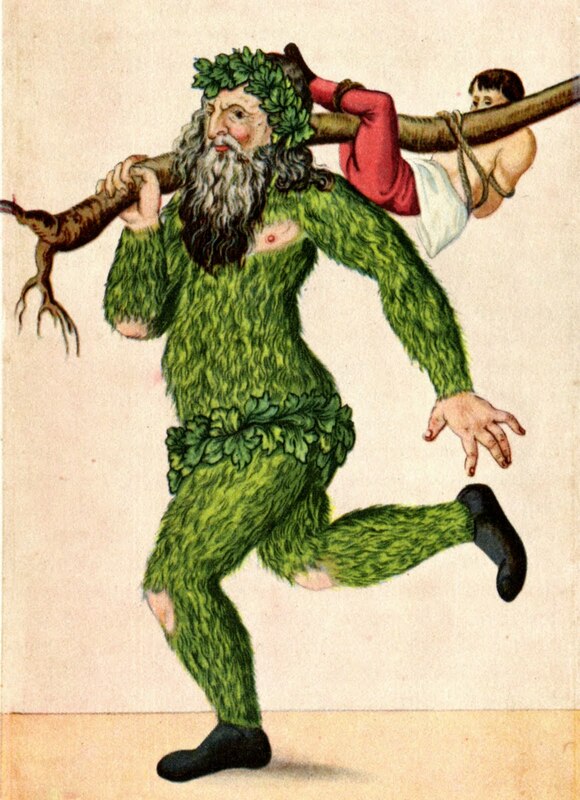 The Green Man was a doomed soul that went down to his own lust. 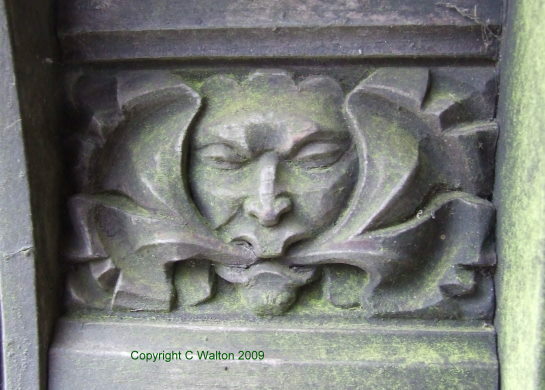 The fertile strength of the Green Man degenerated into wicked horniness and lust. Instead of being a lord of the forest, De Wildeman became a soulless god-abandoned man, or even a demon. The images remained in the church but their meaning was undergoing a sad transformation. 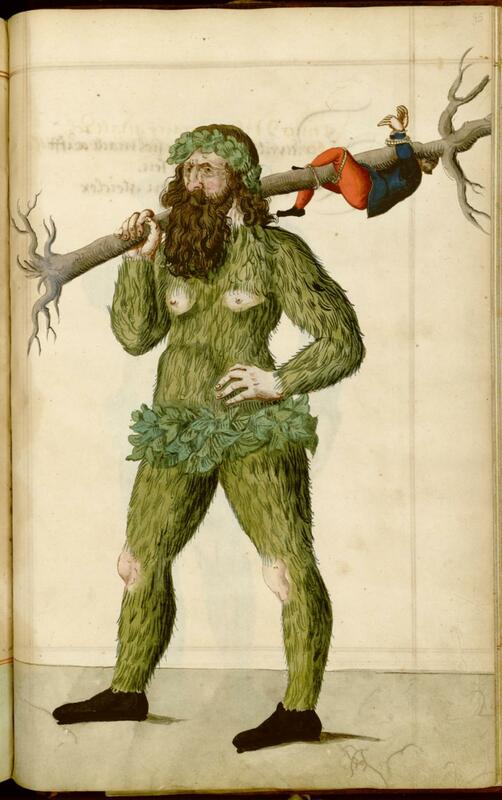 Within the church, the Green and the Wild Man became corrupted souls or demons. Apart from that, they remained for a long time their function – initiation of the young man and fertility for the community in the May rituals. These often ended in the pub or inn! That was the meeting place for the unions and guilds who organized the processions and the like. 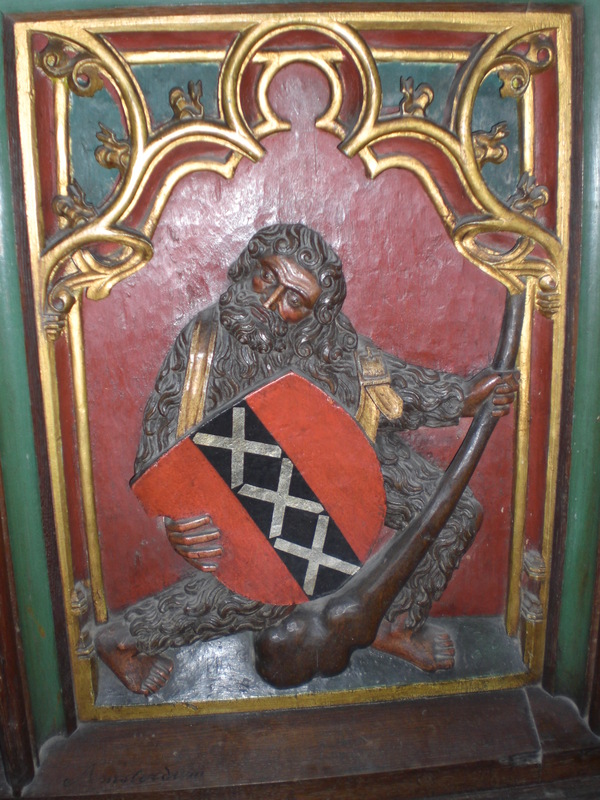 This can still be seen on signs of inns and cafes with the image of a Green or a Wild Man. This may seem like a strange conclusion to all of today’s idealization of nature. But wild nature is only too dangerous and whoever wanted to survive had to make the transition to adulthood and control his nature. But who really controls that does not oppress. In times of celebration or struggle he shows his wildness, his wild hair and his masculinity. He shows that in his time he can show, control and, if desired, store his wild energy. That is the sign of a grown man who knows how to handle his treats and that’s why he wins his wife in the party and overcomes his opponent in the fight. 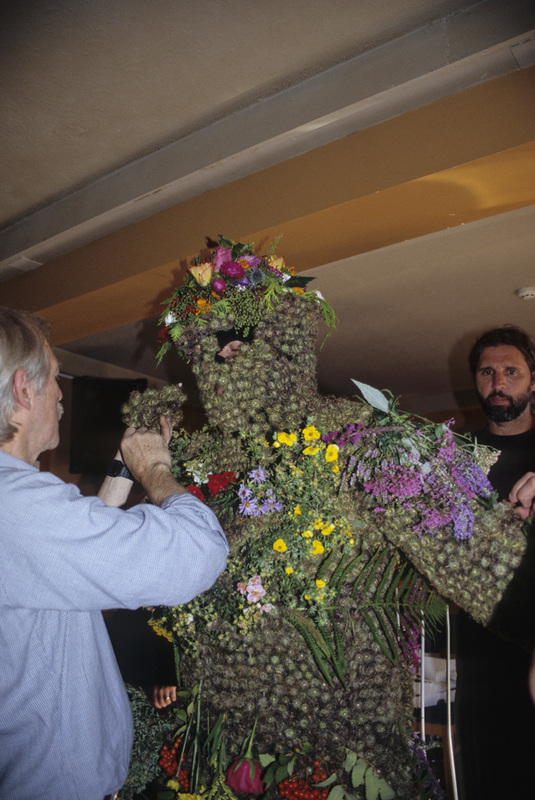 The Green Man has not disappeared either through the transformation. He lives in every man who every now and then releases his inner child and absorbs his feeling and action and enjoys it so that the green heart energy flows! But the Green Man can only survive in his pure enjoying form by first dying in ritual. During a New Year’s Eve feast at King Arthur’s court, a strange figure, referred to only as the Green Knight, pays the court an unexpected visit. He challenges the group’s leader or any other brave representative to a game. 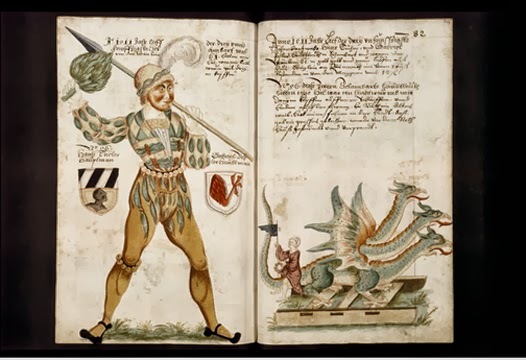 The Green Knight says that he will allow whomever accepts the challenge to strike him with his own axe, on the condition that the challenger find him in exactly one year to receive a blow in return. Stunned, Arthur hesitates to respond, but when the Green Knight mocks Arthur’s silence, the king steps forward to take the challenge. 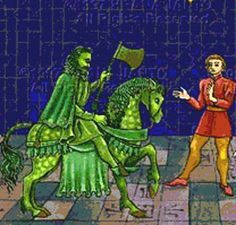 As soon as Arthur grips the Green Knight’s axe, Sir Gawain leaps up and asks to take the challenge himself. He takes hold of the axe and, in one deadly blow, cuts off the knight’s head. To the amazement of the court, the now-headless Green Knight picks up his severed head. Before riding away, the head reiterates the terms of the pact, reminding the young Gawain to seek him in a year and a day at the Green Chapel. After the Green Knight leaves, the company goes back to its festival, but Gawain is uneasy. Time passes, and autumn arrives. On the Day of All Saints, Gawain prepares to leave Camelot and find the Green Knight. He puts on his best armor, mounts his horse, Gringolet, and starts off toward North Wales, traveling through the wilderness of northwest Britain. Gawain encounters all sorts of beasts, suffers from hunger and cold, and grows more desperate as the days pass. On Christmas Day, he prays to find a place to hear Mass, then looks up to see a castle shimmering in the distance. The lord of the castle welcomes Gawain warmly, introducing him to his lady and to the old woman who sits beside her. For sport, the host (whose name is later revealed to be Bertilak) strikes a deal with Gawain: the host will go out hunting with his men every day, and when he returns in the evening, he will exchange his winnings for anything Gawain has managed to acquire by staying behind at the castle. Gawain happily agrees to the pact, and goes to bed. The first day, the lord hunts a herd of does, while Gawain sleeps late in his bedchambers. On the morning of the first day, the lord’s wife sneaks into Gawain’s chambers and attempts to seduce him. Gawain puts her off, but before she leaves she steals one kiss from him. That evening, when the host gives Gawain the venison he has captured, Gawain kisses him, since he has won one kiss from the lady. The second day, the lord hunts a wild boar. The lady again enters Gawain’s chambers, and this time she kisses Gawain twice. That evening Gawain gives the host the two kisses in exchange for the boar’s head. The third day, the lord hunts a fox, and the lady kisses Gawain three times. She also asks him for a love token, such as a ring or a glove. Gawain refuses to give her anything and refuses to take anything from her, until the lady mentions her girdle. The green silk girdle she wears around her waist is no ordinary piece of cloth, the lady claims, but possesses the magical ability to protect the person who wears it from death. Intrigued, Gawain accepts the cloth, but when it comes time to exchange his winnings with the host, Gawain gives the three kisses but does not mention the lady’s green girdle. The host gives Gawain the fox skin he won that day, and they all go to bed happy, but weighed down with the fact that Gawain must leave for the Green Chapel the following morning to find the Green Knight. New Year’s Day arrives, and Gawain dons his armor, including the girdle, then sets off with Gringolet to seek the Green Knight. A guide accompanies him out of the estate grounds. When they reach the border of the forest, the guide promises not to tell anyone if Gawain decides to give up the quest. Gawain refuses, determined to meet his fate head-on. Eventually, he comes to a kind of crevice in a rock, visible through the tall grasses. He hears the whirring of a grindstone, confirming his suspicion that this strange cavern is in fact the Green Chapel. Gawain calls out, and the Green Knight emerges to greet him. Intent on fulfilling the terms of the contract, Gawain presents his neck to the Green Knight, who proceeds to feign two blows. On the third feint, the Green Knight nicks Gawain’s neck, barely drawing blood. Angered, Gawain shouts that their contract has been met, but the Green Knight merely laughs. The Green Knight reveals his name, Bertilak, and explains that he is the lord of the castle where Gawain recently stayed. Because Gawain did not honestly exchange all of his winnings on the third day, Bertilak drew blood on his third blow. Nevertheless, Gawain has proven himself a worthy knight, without equal in all the land. When Gawain questions Bertilak further, Bertilak explains that the old woman at the castle is really Morgan le Faye, Gawain’s aunt and King Arthur’s half sister. She sent the Green Knight on his original errand and used her magic to change Bertilak’s appearance. Relieved to be alive but extremely guilty about his sinful failure to tell the whole truth, Gawain wears the girdle on his arm as a reminder of his own failure. He returns to Arthur’s court, where all the knights join Gawain, wearing girdles on their arms to show their support. 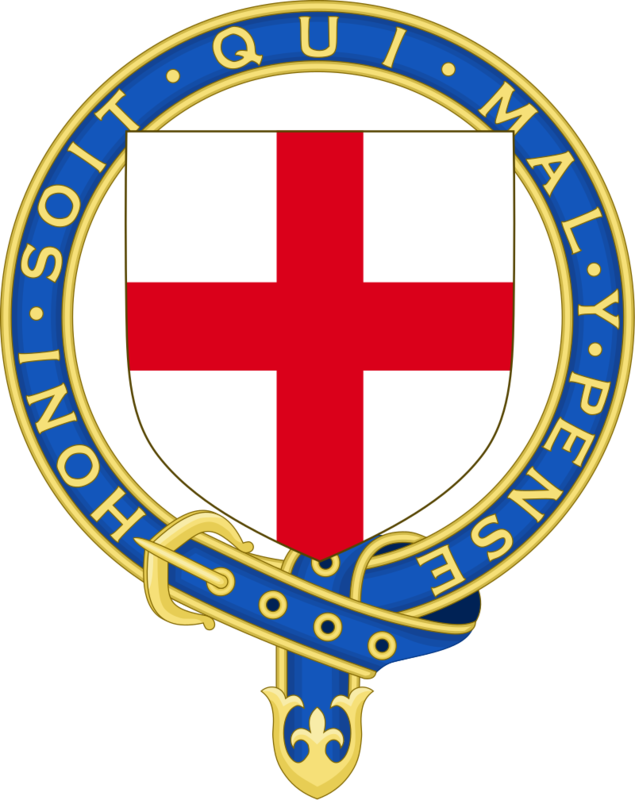 There is a connection between the Order of the Garter and the Middle English poem Sir Gawain and the Green Knight (late 14th century). 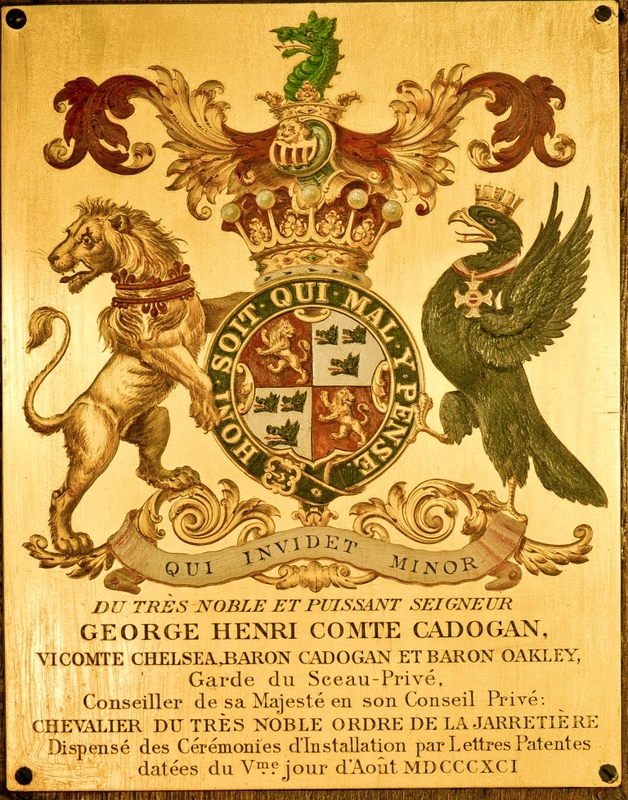 The motto is inscribed, as hony soyt qui mal pence, at the end of the text in the sole surviving manuscript in the British Library, albeit in a later hand. The Golden Bough: A Study in Comparative Religion (retitled The Golden Bough: A Study in Magic and Religion in its second edition) is a wide-ranging, comparative study of mythology and religion, written by the Scottish anthropologist Sir James George Frazer. The Golden Bough was first published in two volumes in 1890; in three volumes in 1900; and in twelve volumes in the third edition, published 1906–15. It has also been published in several different one-volume abridgments. The influence of The Golden Bough on contemporary European literature and thought was substantial.